Sporting the chrome dome look for Bryan Singer’s ongoing X-Men: Apocalypse, James McAvoy today introduced the first official trailer for Victor Frankenstein along with co-star and supernatural partner-in-crime, Daniel Radcliffe. Adopting a novel twist on Mary Shelley’s classic tale of life and death – and the blurry line between them both – Fox’s new spin on an old legend is to be directed by Paul McGuigan with a script from Chronicle‘s Max Landis. 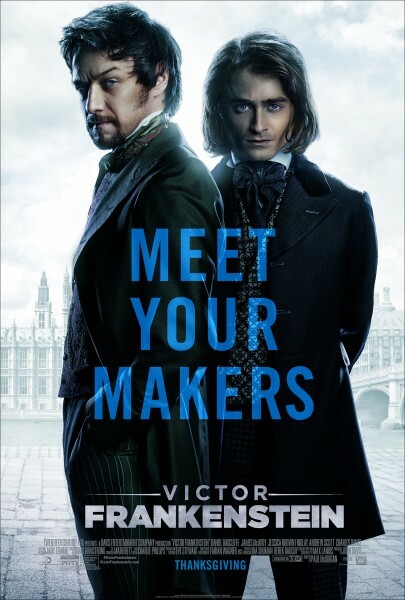 Setting aside a significant chunk of the established lore, Victor Frankenstein will primarily focus on the relationship between McAvoy and Radcliffe’s co-leads as they strive to resuscitate dead animals and creatures and bring them back from the brink. For the flick, McAvoy will play the titular, slightly unhinged visionary, while Radcliffe is on board to portray a revised version of the protégé Igor Strausman, who has been straightened out by our protagonist in every sense of the word. Toying with forces beyond their control, the first trailer certainly packs a punch, with enough explosive action shots to draw in a wider audience. Still, it’s the core relationship between the two leads that has us cautiously optimistic, and we’re intrigued to see how their dynamic plays out even as things begin to go awry. Victor Frankenstein will introduce a decidedly different spin on the classic tale when McGuigan’s feature opens on November 25. In the meantime, you can check out the brooding new poster for the supernatural flick below.